The face of Pine Creek is slowly changing with homeowners Xeriscaping their yards and parkways. Xeriscaping is derived from the term “xeric” which means requiring a small amount of moisture and using drought- tolerant landscaping. 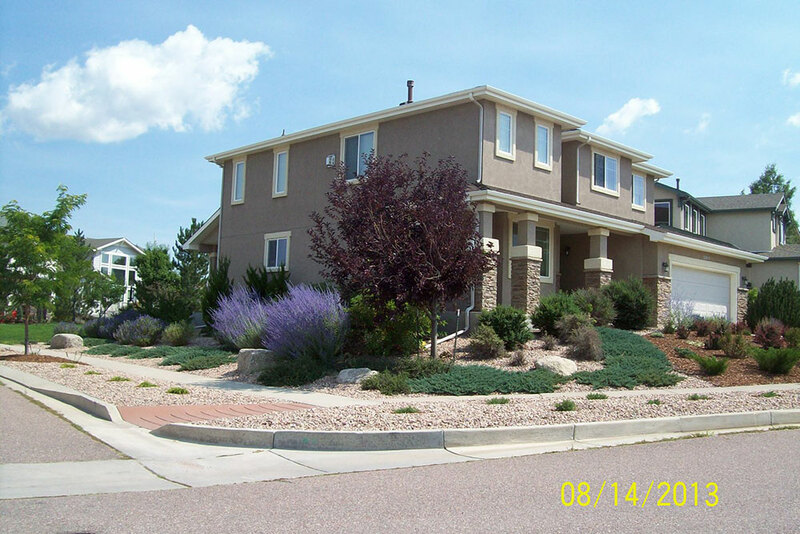 In fact, since 2011 the Modifications Committee has processed close to 40 requests from homeowners in Pine Creek to convert a portion of their property to Xeriscaping during the summer mouths of May through August. Xeriscaping is a deviation from the traditional grass in the front yards and along the parkways. 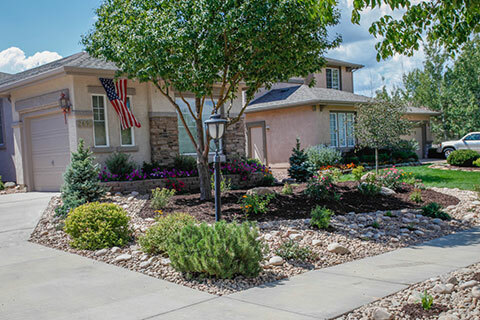 Some residents may feel Xeriscape detracts from the beauty of the neighborhood; however, the intent of Xeriscaping is to reduce the amount of lawn space by replacing grass with beds of rock or wood mulch and adding draught-tolerant plants that thrive in high desert alpine areas. Colorado Statute 37-60-126, adopted in 2006, established the state water conservation and drought mitigation plan. This plan defines Xeriscape as “the principles of landscape planning and design, soil analysis and improvement, appropriate plant selection, limitation of turf area, use of mulches, irrigation efficiency, and appropriate maintenance that results in water use efficiency and water-saving practices”. The plan further limits HOAs from enforcing restrictive covenants that prohibits Xeriscaping. As noted from the discussion above, Xeriscaping is not “zero-scaping” where the property is completely covered with rock and devoid of any plant materials. The Pine Creek developers recognized the need for Xeriscaping and addressed this in the initial Pine Creek Design Guidelines published in 1998. The PCVA Modifications Committee is charged with reviewing landscaping requests from homeowners. The Modifications Committee diligently works with each homeowner to ensure the landscape change meets the ground rules established in the Community Guidelines for water management, plant material selection, front yard and parkway appearance, and a uniform transition between adjacent lots. They look for consistency throughout the Pine Creek neighborhoods to maintain continuity and community standards. Whether you are a traditionalist or a conservationist, there is an intrinsic beauty in both landscape plans and appearances. Pine Creek has many diverse features that add to the theme and identity of the community. This diversity extends to this wonderful place we call Colorado. We all enjoy our diverse surroundings and embrace the various landscape features of our environment. We can find the traditionalist views in the Colorado Springs downtown district and the conservationist views in the prairies we live on. Take a minute to admire the benefits of both. Xeriscaping (less commonly xeroscape) refers to landscaping and gardening in ways that reduce or eliminate the need for supplemental water from irrigation. It is promoted in regions that do not have easily accessible, plentiful, or reliable supplies of fresh water, and is gaining acceptance in other areas as water becomes more limiting. Xeriscaping may be an alternative to various types of traditional gardening. The following paragraphs relate specifically to xeriscaping. 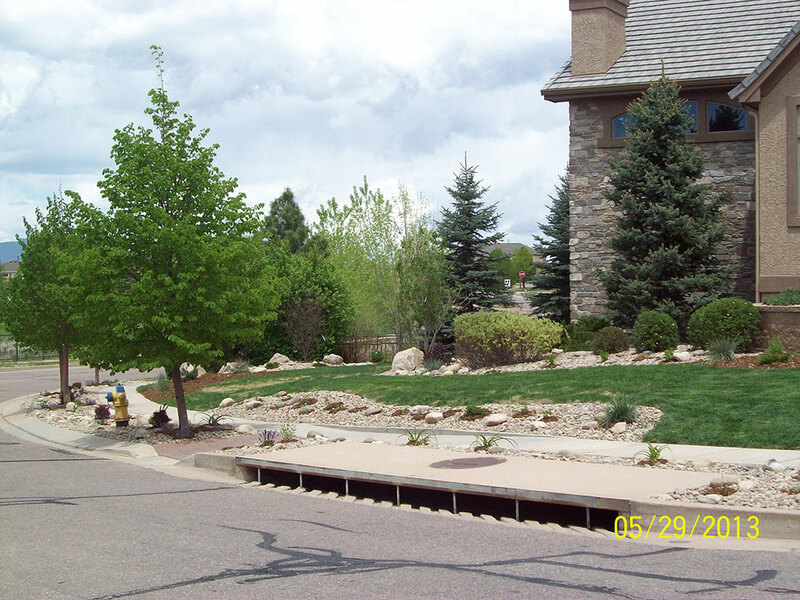 e) Xeriscape landscaping is acceptable and each submittal will be reviewed on a case by case basis. f) Xeriscape requests for the parkway areas will be reviewed on a case by case basis. All submittals must utilize a high density of low growing Xeriscape type plants in conjunction with the proposed landscape material. Plants that are 24-inch or lower are preferred where vehicle or pedestrian visibility is not an issue. d) Xeriscape landscape with rock mulch will require 1 plant per 2 square feet depending on species. b) Where no side yard fencing exists, landscaping must blend with the adjacent landscape to avoid delineating property lines. Xeriscape renovation requests will be reviewed on a case by case basis. Landscaping between lots shall present a uniform appearance. Tree and shrub massings shall blend, and hard edges such as mow strips, edging and walls between lots shall be minimized. Refer to Exhibit 3. Refer to Section 2.13.16 for mulch requirements on abutting lots. This requirement is waived for abutting lots separated by a solid wood fence. Xeriscape requests must use a 2-6" high density of low growing Xeriscape ground cover where transitioning with neighboring turf. Other transition areas will be reviewed on a case by case basis. a) Where a lot abuts a non-irrigated or “native” portion of the golf course or common areas, an undulating transition zone shall be created on the lots to blend into the golf course or common area. This line should be 10 feet from the rear fence at the side property line and may meander as close as 7 feet to the rear fencing within the lot. Creating an area greater than 10’ is permitted; planting requirements will be enforced. Xeriscape is allowed in the transition zone and will be reviewed on a case by case basis. see Page 40 in community guidelines.